BMW's Spartanburg, S.C. plant plans to add 300 jobs in 2012. A rebound in manufacturing jobs is helping some areas of South Carolina recover. NEW YORK (CNNMoney) -- At first glance, South Carolina would seem to be in pretty bad shape. The state, home of Saturday's Republican primary, has a 9.9% unemployment rate and 18% of its population lives in poverty. But the numbers don't tell the whole story. Signs are already emerging that South Carolina may start booming this year. The state is likely to be the second-fastest growing over the next sixth months, according to forecasts from the Philadelphia Federal Reserve. "It's not to say that we're going to have the most prosperous economy, but our prospects for growth in 2012 are strong relative to other states," said Doug Woodward, an economics professor at the University of South Carolina. An auto renaissance is helping to revive some of the state's rural areas. 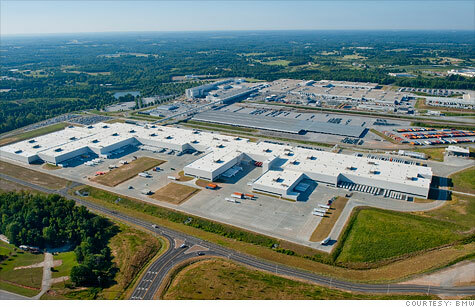 Just last week, BMW announced a $900 million investment in its Spartanburg factory, adding 300 jobs. Upstate areas are benefiting from skilled and often high-wage manufacturing jobs being added by Michelin, Fluor and General Electric (GE, Fortune 500). And in the southeast, Boeing (BA, Fortune 500) is a big player. Despite objections from the National Labor Relations Board, the aerospace giant opened a new $750 million assembly plant in North Charleston in June. In addition to the 9,000 jobs the company said were created in the construction phase, the factory now employs more than 5,000 people. "Manufacturing is a big strength for South Carolina. Factories are creating jobs here and their big supplier network continues to grow," Woodward said. "Take a walk in Greenville [where GE and Fluor have large plants], and it doesn't look like a recession." Overall, manufacturing jobs grew about 5% last year in the state, and Woodward is projecting another 5% increase in 2012. Meanwhile, Columbia, Charleston and Rock Hill are being helped by jobs in professional and business services, which rebounded in full force and are back at 2007 levels. They're also benefiting from hiring in education and health services, which barely missed a beat in the recession and has grown 8% over the last three years. The state's high unemployment rate is more a reflection of long-term weakness in rural communities -- places that may be a shell of their former selves, said Wells Fargo Chief Economist John Silvia. Marion County, which recently had a whopping 17.3% unemployment rate has struggled with joblessness long before the recession began. It's unemployment rate has been in the double digits since 2002. "The rural areas have poverty and we need help to get our population to the point where they can get job," said Anne Rice, executive director of the USC Salkehatchie Leadership Institute in Allendale County. There, the unemployment rate is 16.9% and roughly 40% of the county's 10,000 residents live in poverty. 0:00 / 2:41 Was Bain a job killer under Romney? But even rural South Carolina might be poised for a turnaround. Rice is optimistic that recent efforts to bring more employers to the state will improve her area. In the last three months alone, the region has attracted several small businesses, including a state-of-the-art plastics recycling facility, an Egyptian company that makes safety clothing and a new factory that manufactures store fixtures. Other local businesses, including the Doc Depot -- a medical document retrieval service -- have also announced expansions. "This is a wonderful part of South Carolina and a lot of people don't realize the potential we have," Rice said. "We're working as hard as we can to make things better." Has Obama's housing policy failed?